So much has changed since those days. My father’s restaurant, a landmark on Miami Beach, was torn down. A high-rise stands in its place. I call these buildings “concrete monsters”. They have spread like wildfire over the old neighborhood, casting dark shadows over the beaches. On South Beach, the music pulsates… beautiful people are everywhere. They rush expressionless from place to place, talking and texting on their cell phones, oblivious to their surroundings. Too busy to peel away the glitzy facades and perhaps discover a hidden treasure! The Tsatske (knick-knack) store, a movie theater with a .25 matinee, the family owned food market, bakery and butcher, the elderly lined up for the early bird special, the sounds of Yiddish and Spanish, blending together like a woven tapestry. 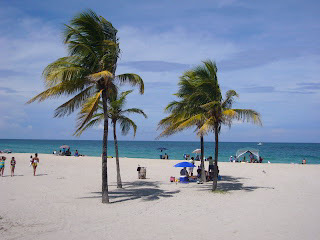 The Miami Beach of yesteryear that I hold in my heart forever! TT/Carroms and Watching ships beach whilst sitting on the sea front. I looked up Willingdon Island to see where it is. I can imagine how peaceful it must have been for you to sit and stare out into the sea. It sounds like you love the beach as much as I do. Thanks for sharing your story!